For years, residents of Minamata, a town located on Kyushu (Japan's most southwesterly island), had observed odd behavior among animals, particularly household cats. The felines would suddenly convulse and sometimes leap into the sea to their deaths  townspeople referred to the behavior as "cat dancing disease." In 1956, the first human patient of what soon became known as Minamata disease was identified. Symptoms included convulsions, slurred speech, loss of motor functions and uncontrollable limb movements. Three years later, an investigation concluded that the affliction was a result of industrial poisoning of Minamata Bay by the Chisso Corp., which had long been one of the port town's biggest employers. As a result of wastewater pollution by the plastic manufacturer, large amounts of mercury and other heavy metals found their way into the fish and shellfish that comprised a large part of the local diet. 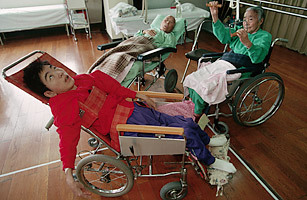 Thousands of residents have slowly suffered over the decades and died from the disease. It has taken as long for some to receive their due compensation from the corporation. See TIME's 1975 story on the Chisso Corp.